I was just on the Today Programme on Radio 4 talking about dumbing down science in response to this piece in New Scientist by Kathy Sykes (who I like, and regard with some hope as a bit of a mate by the way). I won’t talk about it too much here since I’m hopefully going to write something on the subject for either New Scientist (if Graham Lawton gets back to me: hello Graham!) or elsewhere writing a piece on the same subject which will hopefully come out in the 9th May edition of New Scientist. One thing though: asked why people in academia can sometimes be critical of their colleagues who work with the media, I used the examples of best practise offered by Kathy Sykes, of which Robert Winston, professor of the public understanding of science at Imperial, was one. 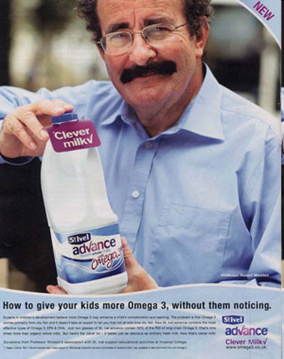 He is indeed a good example since, as an illustration of the very issue being discussed, many scientists were disappointed by his appearance in the adverts for an omega-3 product where some felt it was unfortunate that with his medical reputation, and TV appearances, he was now promoting a commercial product. These adverts were found by the ASA to breach their guidelines on substantiation and truthfulness and were subsequently withdrawn. I’m afraid I think many scientists quite rightly regard media scientists engaging in commercial endorsements with considerable concern, whether it is Lord Winston (who since 2008 has had a new role of professor of the public understanding of science in Imperial) or Susan Greenfield’s personally endorsed range of computer games to improve your brain (£88 and trashed by Which magazine), or any of the others. I think it is problematic when the people who we hold up to promote the public’s understanding of evidence, of how we know if something works or not, endorse commercial products in this fashion, and inevitably some other academics will think less of them for it. This is the head of the Royal Institution, and a man who holds a professorship in the public understanding of science at Imperial, after all. This is certainly not my only concern about dumbing down and the work of some media scientists. This is me struggling to contain my massive logorrhoea so I can write about the issue properly later. Oh but I will say, finally, as the programme ended, I pointed out (into a dead microphone) that the programmes which Kathy Sykes flagged up as good examples of science broadcasting were some time ago, and not on telly now. In fact looking at iPlayer right now there are 14 episodes of snooker, each 2 hours long, and just one science documentary, about bee colony collapse. This is presented by Martha Kearney, and repetitively restates the problem for the first 30 minutes, at which point I gave up and went to read a science blog instead. Graham Lawton of New Scientist has kindly taken a 550 word piece off me on this topic so I can’t say what I think about all this at length until 9th May. Annoying, eh? Yes, he is the man behind the “Darwin was wrong” episode. I quite like him as a bloke. I’ve been finding the Rain, Wind and Snow weather shows on BBC4 quite good for the science – any show with a heavy-duty discussion of the coriolis effect must be doing something right? But I totally agree that some of the Horizon shows have been disgraceful, the mathematics one particularly. I counted three bits of maths: the Monty Hall problem and Euclid’s proof of Primes (both well explained) and some guff about a hyper-building in Paris. I have solved the problem of crap television; esp crap science television. I slung the tele in the skip and went fishing. I just attended Famelab, which was the peg for the Today item, in both London and Oxford, and was struck by the fact that the judges (in this competition for a three-minute scientific performance) almost invariably prioritised Charisma over the Content and Clarity (their other two declared criteria) in their judging decisions. The whole thing was more geared to science-themed theatre than actually conveying knowledge, or even appreciation of the power of science. I think the judges are so pleased to be “communicating” that they underestimate the intelligence of the audience. A pity. In amongst all the shouting it seems that there is a point in there somewhere. Much of the bickering Kathy Sykes talks about is annoying, becasue it’s not actually about the science. If there was more actual argument about the science itself, that would be great. “As far as “educating the public goes”, then we do have the BBC trying something with the “Professor Regan” series which has come up with some reasonably if rather plodding conclusions. 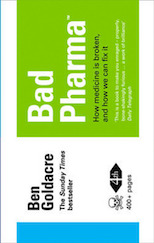 It was interesting that they turned down the placebo affect of Homeopathy whilst keeping on the shelves the similar effects of big-named branded aspirin and the like over generics. As far as I saw in the Regan show, homepathy was binned because it performed no better than placebo, while the use of brand-name drugs did exhibit a better than placebo (and generic) performance. In fact, I just happened to be reading the same chapter in Ben’s book the night I watched it and thought the TV show did a reasonable job of explaining it, though Ben talked about the cultural part of placebo effect in more detail. It wasn’t that dumb though, by any measure. I’d agree with the Derren Brown thing too, almost like a TV version of John Allen Paulos. It was exemplary in explaining risk and probability and, unusually for C4 didn’t insist on endlessly summarisng before and after each nd every commercial break; this is something that vexes me so much I can hardly bear to watch C4 any longer most of the time. The great science programmes don’t have to be full of hard-core stuff. The oft quoted example of Carl Sagan’s Cosmos is a perfect one. This is the programme that, at 9 years old solidified the interest in astrophysics and cosmlogy that led me to the degree I did and that lasts to this day. It aksed more questions than it answered and made me want to find out more. It also made me search out his writing. And for that reason I’m thankful because it meant I found The Demon-Haunted World, which is one of the best science books I have ever read (even including yours Ben – sorry!). iii in some places an ignorance of science is almost worn as a badge of honour. You hear people blithely admit that they “aren’t good with numbers”, who would be appalled if they heard someone admit that they “had atrouble with word”. What’s the difference? v. there is sometimes an attitude of: I don’t understand this. and if I can’t the audience won’t either, after all I m educated and they’re not (see iii). vi. a culture exists of “science is hard”. and if it’s hard it’s dull, right? and @44: I agree, Euler’s identity is a thing of beauty indeed. And so’s the Golden Ratio. Now there’s something good for 8 year-olds! I remember learning about it when I was 8 because of Johnny Ball and Think of A Number. See, even kids don’t get science programming as good as we did. Oh. Why can’t I type properly? I get all my TV science from ‘The Big Bang Theory’ channel 4….its all one requires! As a child I was an inveterate science programme watcher. The fact that I ended up in medicine owes quite a lot to Jonathan Miller’s “The Body In Question” series, but Horizon was required viewing whatever the topic (and I remember Connections fondly, too). On the day the LHC went “Live”, the BBC showed a programme showing how it had covered the Big Bang theory over the past fifty-odd years, and I remembered quite a lot of the clips from Horizon episodes of the 70s and 80s. Sometimes the science had moved on since, but they generally stood out as fantastic reporting of an evolving concept. This served to show how poor most modern Horizon episodes are – on the odd occasions I bother to look at them. Being a medic leaves little time for keeping up with other science – physics/ cosmology was once my other interest, and I was probably far more up with the latest ideas thirty years ago than I am now. Yet I can still tell that Horizon, and much other TV science shows are far less challenging than they once were. Certainly, a high proportion of newspaper reporting of the subject I Do know about, medicine, verges on the scientifically semi-literate. I tend to assume that its reporting of other subjects about which I know less, whether other science disciplines or non scientific, would demonstrate similar poor understanding of the issues to those in the know. I find it disturbing when I see scientists pat each other on the back blaming everybody – specially journalists, but also schools, government, corporations, PR departments, etc. – for the poor quality of science coverage in the media, except themselves! Some of the criticisms in this thread hit the mark. But many, as well as the solutions suggested, are naive or unrealistic. However, my point is that, as the primary source of scientific information, scientists can be part of the problem as much as journalists. I find that scientists are very often poor science communicators. They don’t prepare seriously before an interview (but they complain if the journalist is ill prepared). Some make no effort to be understood and become quickly impatient. Many have no idea of the scientific literacy of the public. Some speak as if everybody had a college degree in their discipline. The result is that scientists themselves can be responsible for misleading journalists. And let’s forget about confusing press releases issued by their own University/research center… and scientists who complain when in fact they just can’t recognise good scientific journalism. And there is always that paper/segment on biology that biologists criticize because it’s “dumbing down” the science while physicists find it very interesting. Scientists and journalists should join forces to confront the problem of poor science coverage. But this self-righteous indignation from scientists who thinks they’re so good that everybody else, except them, has to change and adapt doesn’t help at all. I’m a former scientist (PhD in molecular biology) turned into a science journalist. Ive been gamely working with one of the Horizon producers to try and shake a bit a life back into the brand/format including directing them to some sciency discussions on the forum I started where various people had a good old moan about the shows faded glory and how it might be restored. I think they were listening and live in hope. oh, and I agree that the quality and quantity of science programming on TV right now is pretty dire. the BBC in particular have no excuses. I think the best science program on TV at the moment is Mythbusters (on the Discovery channel). Yes, it doesn’t tackle the big science issues, yes it’s an entertainment programme, but they do teach the scientific method (if such a thing exists). About the need to test things against the real world, about controls in experiments and the reliability of results. Some stuff is just pure entertainment but there are some genuinely great examples of very good science done. I’d like to put in a good word for ‘Sky at Night’. For years it was condemned to the midnight (or later) slots. At least digital TV now allows a BBC3 broadcast at more civilised hours once a month. Nowadays a typical episode features a couple of scientists talking about their ‘in progress’ research (so not simply received wisdom) and amateur ‘nerds’ doing their own observational work. So a rare example of science in action, including at an amateur or lay person level. Astronomy is one rare area where amateurs still do science. Especially now that chemistry sets, for example, are so sanitised! And I agree with an above comment about Mythbusters – seeing science experiments actually done, where outcomes are unclear, even on relatively trivial topics, has got to have serious educational value. Much kudos to you. We should never underestimate the inspiring influence of an enthused teacher on young people. When a concept tends to be hard to grasp or visualize (or is just plain counterintuitive) that’s when we need good teachers the most. It doesn’t mean that we should be scared of trying. One of the more important influences for me was “Think of a Number” – I have no idea if an equivalent programme for kids exists today. I have an uneasy feeling that by putting my Doctor Who TARDIS-hat on and commenting “If you are hoping to mate with Kathy Sykes then I’m not sure this is going to do the trick”, I’ve fallen into a trap. Has anyone managed to see [Richard Hammond’s Blast Lab]? CBBC I think and the title is promising if nothing else. Iidon’t know if it’s one of the general-interest Open University collaborations that have been on in recent years on BBC or if that effort is still going. I think indeed [Rough Science] was theirs. But I seem to remember seeing something about their getting out of the broadcast telly business, now that there’s broadband perhaps. They also did [The Mark Steel Lecture] for TV with an after-announcement saying more online, come and get it. In the old days they had course material broadcast in the small hours on BBC, making concessions to mature learners but not to casual viewers. In one of Clive James’s book collections of TV reviews from late 60s to early 80s, he observed you could get a free education that way (as well as otherwise of course), and was delighted that they had entire Greek tragedies on, done economically but professionally. There’s quite a lot of science coverage on BBC radio. A lot of features appear twice in different edited versions on Radio 4 and World Service. Some shows are podcast. [Case Notes] has just done a possibly briskly reserched half hour on swine flu. And the other day I looked at Stephen Fry’s Twitter and noticed he was having a medical examination for the insurers of a new series of [QI], or something on those lines, so there’s that to look forward to. I mean, assuming he’s fine. This kind of thing annoys me as much as dumbing down. In most recent science documentaries, there’s a completely unnecessary recap after every single advert break. I refuse to accept that our attention spans have become so short that we can’t remember the subject of the show we’ve been watching for the last half hour. It seems more like an excuse to get away with less, dumber and more poorly-researched content. @lenny law.. agreed, I hope Ben does not treat all his ‘bit of a mate’s with such kindness as to ridicule their jobs in print. But we’re all hypocrites sometimes. I agree with #66 and others. I can accept simplified, dumbed-down and overdramatised science (most of the time). Most Horison episodes would be better if they were reduced to about 20 minutes. The Brian Cox ones tend to have a good level of pacing though, with an acceptable amount of repetition. Can I put in my vote for the Royal Institution Christmas Lectures. Hi Ben – I just re-listened to this, having heard it half asleep when it aired. I can’t help thinking that you went for the wrong target in Winston – the problem is not that his kind of programmes get made (and the ads thing was an unfortunate diversion), it’s what doesn’t get made. There should be dumbed-down science in the media, just as there should be dumbed-down art and history. But attacking it distracts from your more important point: the paucity of anything for a science-literate audience. Perhaps taking the line that “that’s all very well, but…” would serve you better. Most of the problem, as with a lot of the poor coverage, is simply that there are hardly any science-literate journalists. All too many times I’ve tried (and all too often failed) to impress on news desks the bad science behind a story they wanted to run, and they weren’t interested because they didn’t understand it, and they were happy to make a macho show of not understanding it. And I can’t see that attitude, that the cool kids don’t do science, shifting until it’s compulsory to study it to at least age 18.